The Pohutukawa needs no introduction to anyone in NewZealand, it graces the coasts of the North Island and provides a blaze of colour over christmas. Pohutukawa is Maori terminology for"drenched with spray". This would be a common occurance as the trees cling to the cliffs of some of our most exposed coast line. Metrosideros is derived from Metra-middle and sideros-iron, refering to the hardness of the heart wood. While some Metrosideros species are very hardy, the most common forms are quite frost tender while young. Their natural habitat extends from North Cape to Poverty Bay on the Eastern side, and Urenui on the West. They are however, growing successfully in the South Island. By far the best style for Pohutukawa is root over rock. It is one of the quickest plants to get up on a rock I have used. I have even planted small seedlings into holes in scoria rocks and let them grow. Pohutukawa naturally branch heavily from ground level but with wiring and pruning they can be developed into a single trunk. The trees require regular pinching to maintain their shape and because of this they tend to be hard to get to flower as bonsai. You can forego pruning for a year or two and risk loosing shape to get flowers or maintain shape and loose a christmas floral display. They will bud from old wood so shape can usually be regained. 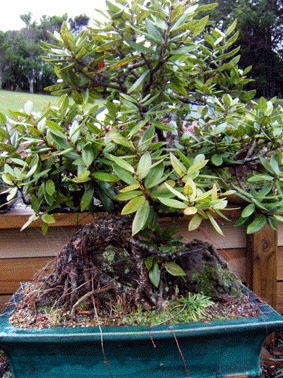 The leaves are difficult to reduce in size so Pohutukawa tend to look better as a larger bonsai where they are better proportioned. In nature plants tend to cling to cliffs with no sign of any soil or nourishment but in fact as a bonsai they require quite heavy feeding through spring and summer to maintain vigour and leaf colour. They should also be kept moist at all times especially when grown over a rock. The photos above show a clump of pohutukawa growing on scoria the second photo shows detail of the strong root structure. This bonsai is approximately fifteen years old. The older wood on Pohutukawa becomes very hard and difficult to shape with wire so all wiring should be carried out on young branches which grow quite vigourously so be careful not to leave it on too long. Older limbs can be bent with care but they snap if bent too far too quickly. Pohutukawa are very hardy but they are prone to insect infestation which while they won't kill the tree they will make it unsightly. A small scale like bug called a chirmid makes its home on the under side of the leaf causing small yellow bumps on the surface. They are also susceptible to caterpillers which hole and notch the leaves both of these insects can be controlled with systemic insecticide which should be sprayed regularly through summer. My reason for contacting you is to ask whether anyone in NZ is growing the Kermadec pohutukawa (metrosideros kermadecensis). This is a tree that I have been playing with for a few years, and seems to be a superior species for bonsai. In fact, I think it is the most promising bonsai species of ANY subtropical/warm temperate species in the world (and I have tried a lot more than most people! ), and it is ideal for an indoor/outdoor bonsai in our climate here in the northern USA. Due to the small leaves, it seems to be a better bonsai candidate than the m. excelsa, and in fact can easily be used as a smaller subsitute for m.excelsa in root-over-rock or landscape settings. Since visiting NZ, I have started several projects using m. kermadecensis to depict the ancient pohutukawas along the steep rocks of the NZ shorelines.